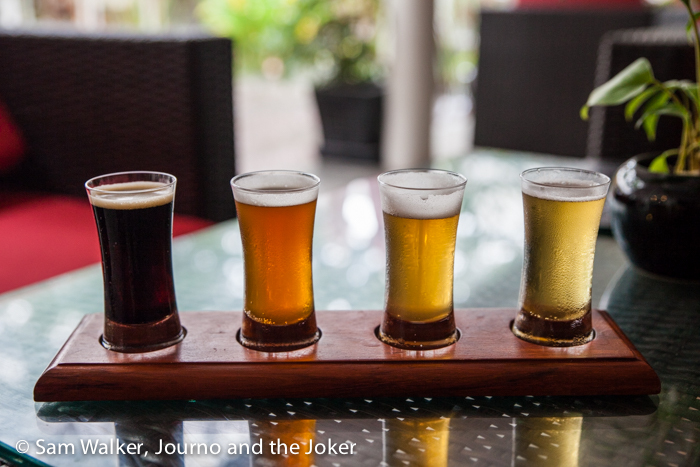 It is October and there is beer – craft beer in fact – so it seems only fitting that we should create our own Octoberfest celebration in Siem Reap. So we spent a lazy Sunday afternoon and evening at the Siem Reap Brewpub, sampling the range of craft beers and I’ve gotta say I think the four beers they make are an extremely nice drop, if you like the fruity beers, as I do. I particularly enjoyed the Dark Ale. 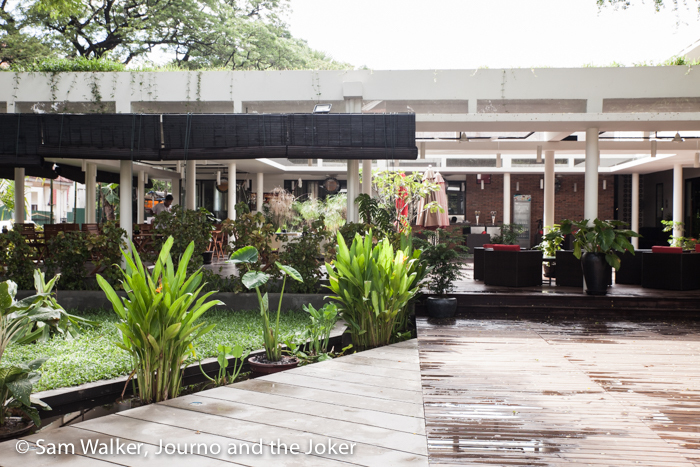 This place has a very relaxing atmosphere with a fish-filled water feature and choice of open air or under cover dining. Also, having some lovely friends to sit around with with and have a yarn to, makes this a very suitable place to unwind for a couple of hours. The food is beautifully presented and the meal I had – a spicy chicken dish (mild of course) was delicious. 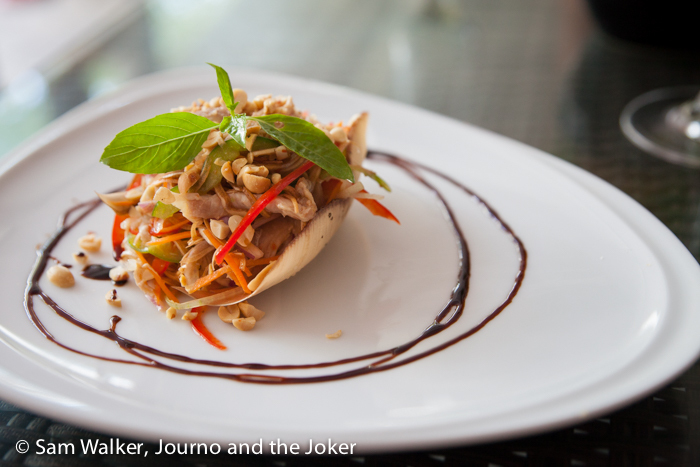 The Journo tried the banana flower salad and the Club Sandwich looks impressive. 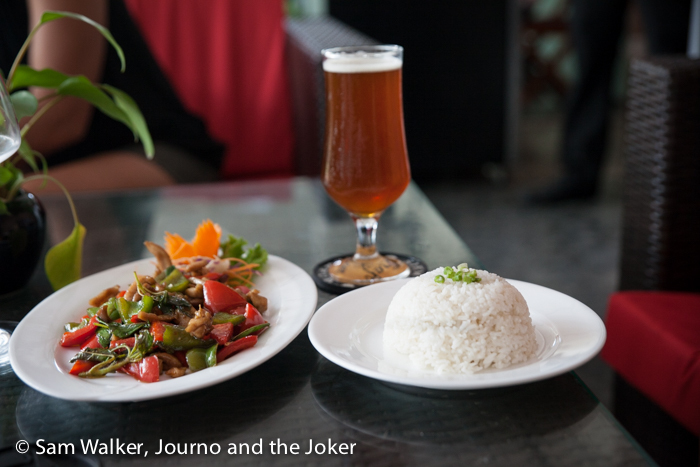 Definitely fine dining in Siem Reap. 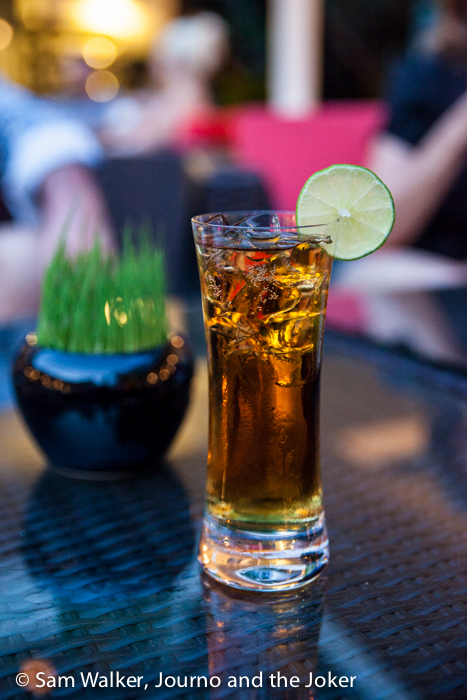 The prices are on the higher side for Siem Reap restaurants but if you are looking for a spot to relax and get away from the dust and the mayhem this is great choice. And of course, for the weirdos like the Journo, who don’t like beer, not even craft beer, there are other options. The Journo thought the Martini was pretty good. All in all, good people, good food and craft beer made for a very good Sunday. Did you go to any Octoberfest celebrations this year? Tell us your experience. I am such a huge fan of the craft brew scene. Excellent post – thank you for sharing! Glad you enjoyed it Sara. 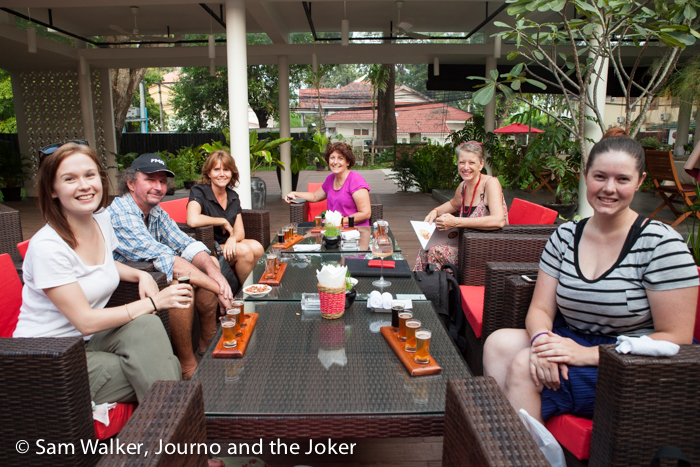 The Joker loves a beer or three and we really didn’t expect to find craft beer in Siem Reap. But the place seems to be taking off since we posted this. Craft beer is the best thing that has happened in the last ten years. I love how it brings people together… both the good and bad kinds of beer! haha Thanks for sharing! Thanks for stopping by Jared. As a non-beer drinker, it’s not my thing but I really wish it was because I love the idea of locally crafted food and drinks. The Joker thoroughly enjoyed it though. And in terms of bad – we tried lavender craft beer in Western Australia. Can’t say that was a winner, even for the beer lovers. We are Sam (the Journo) and Steve (the Joker). We have taken the plunge and opted out of the 9-5 routine in search of more - and less. 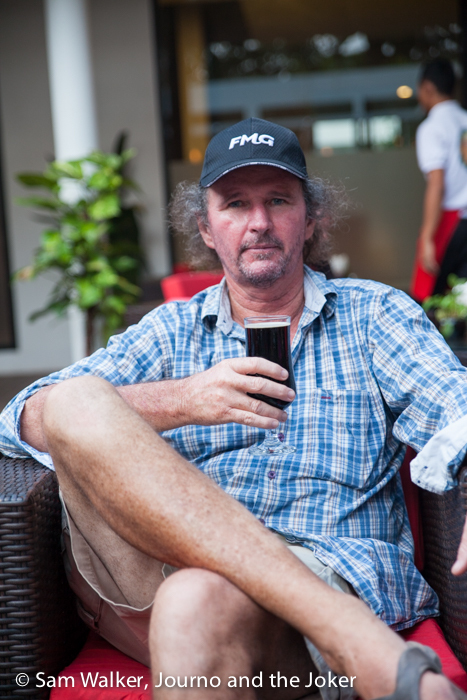 We are living the expat life in Cambodia and enjoying slow travel through the region and after just a few months our lives are richer. All content copyright © 2015, Sam Walker and Steve Linehan, Journo and the Joker. Please don't steal - it's bad karma. This blog is our personal record. It is based on our own adventures and experiences and reflects our opinions. All content is written and edited by us. Any sponsored posts will also be written by us and will include our honest thoughts and opinions. All expenses incurred in the production of this blog come out of our own pocket unless otherwise stated.